Canadian commuters spent an average of 26 minutes travelling to work on a typical day in 2010, including all modes of transportation. Average commuting time is longest in the census metropolitan areas (CMAs) with 1 million residents or more. Commuters in the six largest CMAs spent an average of 30 minutes getting to work in 2010. Those in mid-sized metropolitan areas (250,000 to 999,999 people) took 25 minutes. The average commuting time was longest for commuters in the CMAs of Toronto (33 minutes), Montréal (31 minutes) and Vancouver (30 minutes). In both Toronto and Montréal, more than 1 in 4 commuters had travel times of 45 minutes or more, which was much greater than in any other metropolitan area. Another 1 in 4 had travel times of 30 to 44 minutes. Roughly 82% of commuters travelled to work by car in 2010, while 12% took public transit and 6% walked or bicycled. Commuters who use public transit take considerably longer to get to work than those who live an equivalent distance from their place of work and go by car. In 2010, users of public transit spent on average 44 minutes travelling to work, compared with 24 minutes for those who went by car. Commuting times are door-to-door. Times for public transit are generally longer because its use can involve walking to a transit stop and waiting for a bus. In the six largest metropolitan areas, the average commuting time was 44 minutes for public transit users and 27 minutes by car. The gap in average commuting time was slightly more in mid-sized metropolitan areas: 46 minutes on public transit and 23 minutes by car. The gap was not a result of the distance travelled. 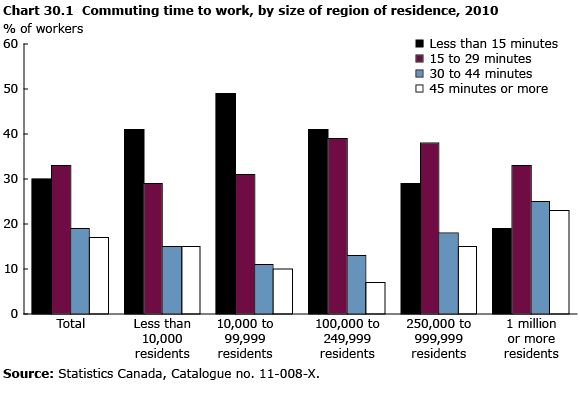 Among workers in CMAs with at least 250,000 residents who travelled less than 5 kilometres to work, car users had an average commute of 10 minutes, compared with 26 minutes for public transit users. The same held true for longer commutes. Average commuting times in the three largest metropolitan areas followed the general trend. In Toronto and Vancouver, it took public transit users about 20 minutes longer than car users to get to work. In Montréal, the difference was much less, about 10 minutes. Of the 10.6 million workers who commuted by car in 2010, about 9 million reported that they had never used public transit for their commute. About 7.4 million of these people thought public transit would be somewhat or very inconvenient. About 1.6 million car commuters, or 15% of all commuters, said they had tried using public transit to get to work. A slight majority of them (53%) considered it inconvenient. Access to public transit is closely tied to land use. It is much easier to provide efficient public transit in high-density residential neighbourhoods typical of the central areas of the largest CMAs, where the pool of potential users per square kilometre is much larger. Public transit users who live in lower-density residential neighbourhoods have longer commuting times because the distances are greater. Less frequent service may also increase public transit commuting times if transfers are necessary and schedules are out of sync. In general, satisfaction with commuting times is high: 85% of commuters in 2010 said they were satisfied or very satisfied with the amount of time it took to get to work; 15% were dissatisfied. Dissatisfaction among commuters is higher in larger urban centres, where traffic congestion is more common. In 2010, the proportion of dissatisfied commuters was highest (20%) in CMAs with 1 million residents or more. Outside those areas, the proportion of dissatisfied commuters ranged from 8% to 10%. Public transit users are more likely than car commuters to be dissatisfied with their commuting times (23% versus 18% in 2010), primarily because it takes them longer on average to get to work. Interestingly, as commuting time increases this pattern reverses: 10% of public transit users with commuting times between 30 and 44 minutes in 2010 said they were dissatisfied, versus 21% of car commuters. Of the full-time workers who took 45 minutes or more to travel to work in 2010, 36% said that most days were quite or extremely stressful. By contrast, this was the case for 23% of workers whose commuting time was less than 15 minutes.